There was a time I was content to simply match three. This was around the same time I had, no joke, a Palm Pilot so I could play Bejeweled with a stylus in class. Nowadays I need a little something more with my matching, and Pixel Defenders Puzzle ($0.99) has plenty more to offer. For starters, it plays a lot like Triple Town (Free) without that game’s aggressive turn limits. Not like “oh my goodness this is the next Yeti Town;" more like “now that’s a clever way to use those mechanics." If you match three units, they upgrade to the next tier of unit. Then you match that with two more like it, and it bumps up another level. Familiar, but you’re not upgrading little trees and houses, you’re upgrading an army. It’s what you do with it next that makes things interesting. 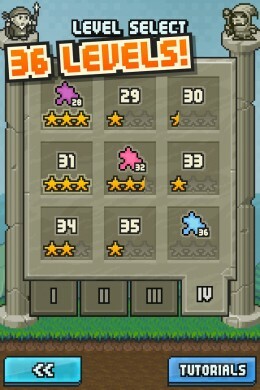 As with Triple Town, you’ll run into all sorts of problems with the tight board. You’ll need to watch for corners and edges rendered unreachable, combos that can’t be completed, and obstacles that can’t be dealt with. You’re not dealing with just one upgrade path and a pile of angry bears, though. 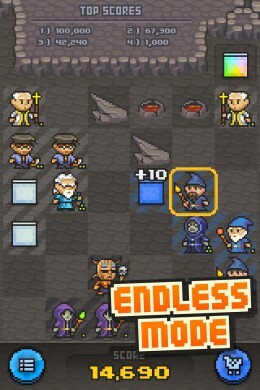 Each of Pixel Defenders Puzzle’s levels gives you a selection of armies to deal with—maybe one, maybe more. Each is defined by its own color, and there is no upgrade path that lets units of different colors get together. Moving around the cramped playing space is a VIP target that needs protecting, or perhaps more than one. These targets have HP bars, and if they run out of health you’re done. Defending them doesn’t have to be complicated, though. Enemies gather at the top of the screen, and they only attack after a number of turns pass. That number is displayed right next to them, so it should be easy to keep on top of it, right? Not quite. Your units muddle things up a bit. Each tier of each color has a unique ability, and those abilities damage enemies or apply status effects. Each unit has a limited number of shots, and once they run out they leave the board. You will regularly find yourself needing to weigh your options: keep upgrading, with the hopes of getting somewhere useful before the next enemy attacks, or fight prematurely and lose badly-needed units. It wouldn’t be a match-3 without an element of luck, of course. In this case it’s with the next piece that spawns. It could be a block of any color. It could be a unit you can use for an upgrade. It could be a wildcard. Or it could be an obstacle. 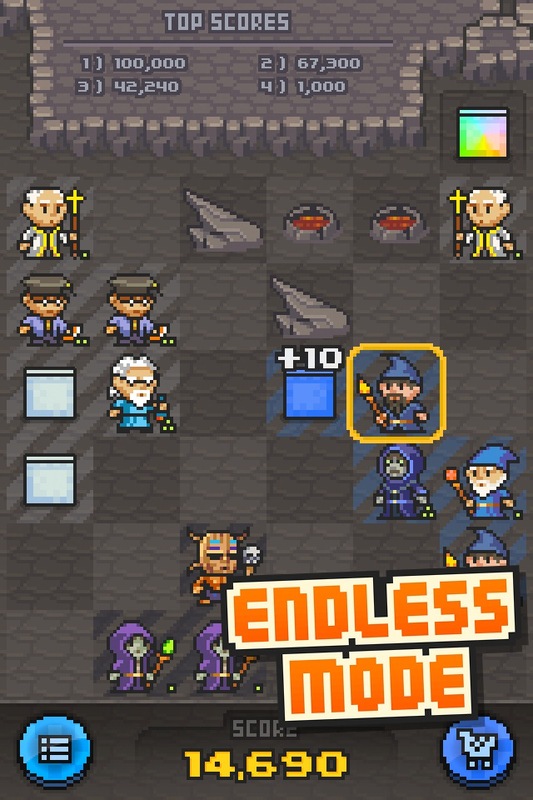 Matching three obstacles clears them and gives you a nice bonus, but they’re rarely what you’re hoping to have next in your queue. There is one more element of the tactics of Pixel Defenders Puzzle to consider: action points. 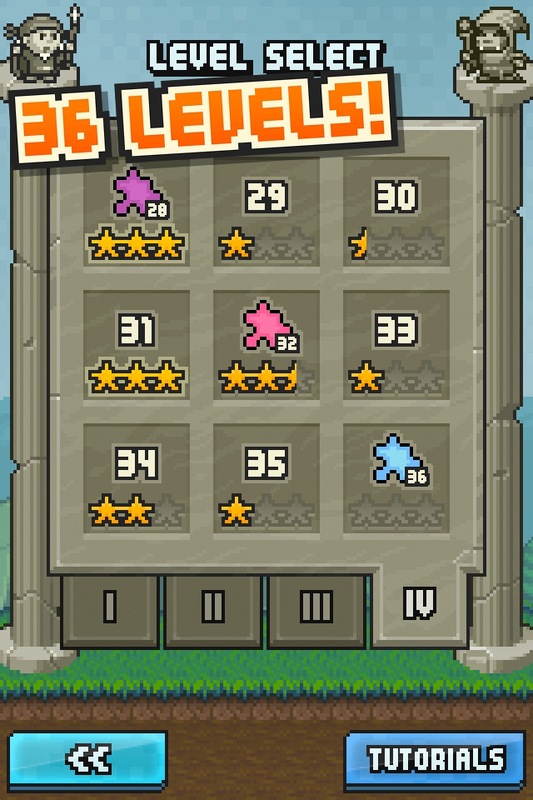 As you match, you earn points that fill up red bubbles on the bottom of the screen. Those are action points. You can only use as many abilities as you have action points to spend. If you focus too intently on attacking the enemy, you may run dry before you take anyone out. It’s a matter of careful planning in an inherently random situation, a task that’s usually fun and occasionally horrifying. If you do well enough at protecting the target, finishing all the enemy waves in the fewest turns, and upgrading your units, you’ll be awarded extra bonus items like wild cards or obstacles that you can pull out in a pinch. You can also buy these in packs, which is a nice safety net to have. There’s currently no limit to how many of these power-ups you can use in a given game, but a fix for this little problem is apparently in the works. 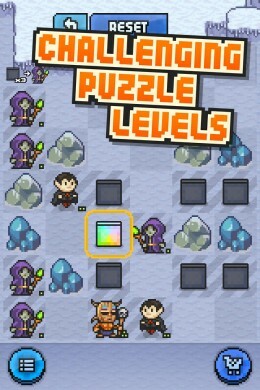 On top of a ton of levels, Pixel Defenders Puzzle also carries an endless mode. This strips out the enemies, making it much more similar to the Triple Town experience. It’s fun, but it’s not the most stimulating way to play. It’s also a touch pointless currently, since the leaderboards are only local. In puzzle mode, the fun is in the choices—and there are a lot of them to make. First you need to decide where to place the next block, planning ahead so that you can upgrade tier after tier. Then you need to evaluate whether the enemy is becoming a risk. If so, you have to decide which units will take the shot and how best to use your action points. It’s a high level of strategy for a match-three, and it will really make you think. There’s always been something satisfying about match-3 mechanics, but after enough years playing them over and over they’re bound to start feeling stale. Pixel Defenders Puzzle steps beyond that by taking something from a game that was already an excellent evolution of the genre and moving it forward to another, even-more satisfying level. It could certainly be more original and there are a few kinks to work out yet, but on the whole it’s a great experience. 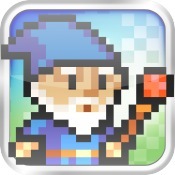 If you loathe match-3s or have something against pixel art, look away. Everyone else: you shouldn’t miss this game.